WGC Bridgestone Invitational golf tournament. -Click Here to see our Exclusive Firestone CC Slide Show and 18 High Quality Digital Pictures! Welcome to our 2013 WGC-Bridgestone Invitational World Federation of Golf Tours golf tournament page - formerly known as the NEC Invitational). In 1996, golf's five leading professional Tours -- the European Tour, Japan Golf Tour, PGA TOUR, PGA Tour of Australasian and Southern Africa Tour -- reached agreement on several key elements of professional golf designed to create new international events beginning in 1999. The 2013 Bridgestone Invitational is being played this week and is the third World Federation of Golf Tours (WGC) event of the 2013 Season. Tiger Woods is back this week and looking for a record 7th win at this event played annually at Firestone CC. This will be a good field of players prepping for next week's PGA Championship which will be played only a couple hundred miles from here in upstate New York at Oak Hill in Rochester. 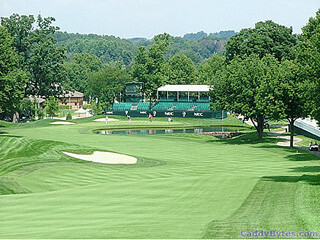 And stay tuned to CaddyBytes.com for more exclusive interviews, stories, and news tournament week!